This article is part of our series: A day in the software life, in which we will be asking researchers from all disciplines to discuss the tools that make their research possible. A large amount of today’s computational and data science involves combining the execution of many tasks that each run a model or transform data, to build up a multi-component model or a multi-stage data transformation. Most researchers initially do this manually, and then (if they have any programming experience) eventually move to using shell scripts when the manual process gets too painful. However, shell scripts tend to limit the work to single resources, as they don’t really work well with parallel computing. An alternative method is to use a system that I’ve been involved in developing: the Swift Parallel Scripting Language. (Note that there’s no relation here to Apple’s Swift, other than that they reused our name.) Swift provides an implicitly parallel and deterministic programming model, which applies external applications to data collections using a functional style that abstracts and simplifies distributed parallel execution. Swift addresses many complications commonly associated with parallel and distributed computing, including scale, distribution, complex dependencies, scheduling, heterogeneity and flexibility, fault tolerance, debugging, and performance. This type of processing is different from how HPC systems are usually configured. For example, sites typically impose policies on batch job schedulers to allow a relatively small numbers of large jobs to run, and will only run an even smaller number of jobs for a given user at once to avoid scheduler overhead and encourage scaling of workloads. The ArcticDEM project needed a way to bundle over 500,000 single-node tasks into a smaller set of 100- to 1000-node jobs. Swift manages the grouping of the ArcticDEM tasks, and also handles the queue of unfinished tasks, adding new tasks into the pool of running jobs as tasks finish. As a result, the ArcticDEM project’s jobs are large enough to avoid burdening the HPC scheduler and still small enough to fit in otherwise unused nodes, increasing the utilisation of the machine. Most importantly, Swift enabled the ArcticDEM project to use over 18 million node hours compute time on Blue Waters since 2016. To date, the project has produced four data releases towards its goal of complete Arctic coverage. The Swift team, led by Michael Wilde at Argonne National Laboratory and the University of Chicago, with Parsl developed by Yadu Nand at the University of Chicago; the ArcticDEM team led by Paul Morin with software lead Claire C. Porter, both at the Polar Geospatial Center, University of Minnesota; and the Blue Waters Science and Engineering Application Support group at NCSA, led by Greg Bauer with Blue Waters Point of Contact Galen Arnold. 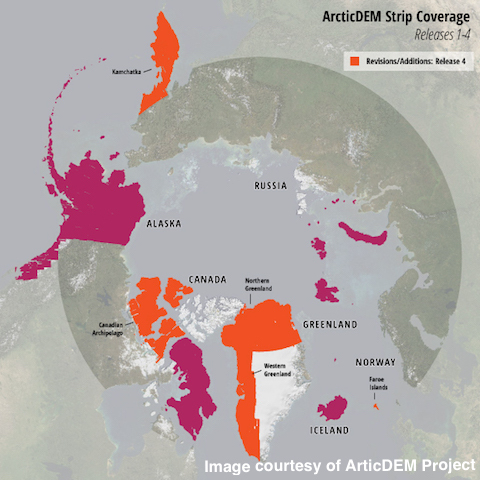 Image: ArcticDEM Strip Coverage (Release 4). Strip DEM files correspond to the overlapping area of the input stereopair image swaths as they are collected by DigitalGlobe’s constellation of polar-orbiting satellites.